The new 2012 Shelby GTS Package is a great alternative for enthusiasts and fans of the GT500 or GT350 snakes. And this will bring a smile to the faces of current 2011 and 2012 Mustang owners. You can own a genuine serial numbered Shelby for a price that won't break the bank. 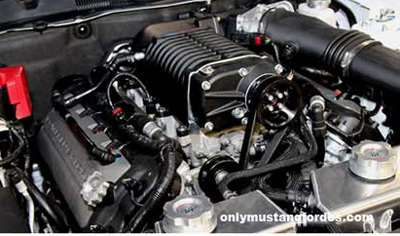 If you are the lucky owner of a 2011 or 2012 V6 powered Mustang, you'll be happy to know that you can get in on the fun too! Not only that, but the V6 powered GTS is lighter and handles even better than a V8 powered snake when equipped with the optional supercharger. The new 2012 Shelby GTS package includes distinctive eye catching and functional additions, including the Shelby "deep draw hood", custom designed front fascia, with a black billet upper grille, plus Shelby badging and special top and side striping package. At the rear you'll find a new Shelby lower rear fascia. Optional appearance goodies include rear quarter window block off plates or quarter window scoops, a custom interior upgrade, shelby/Kicker premium sound system and a Custom car cover. Further adding to the overall package, the interior includes badged floor mats and your personally serial numbered dash plaque. The standard package includes a new Shelby/Borla performance exhaust and Shelby engine plate, which doesn't add to the performance specs, but draws looks nonetheless when the hood is popped open. And while the standard engine additions is minimal, the optional performance engine upgrades are not, including your choice of either a Ford Racing Whipplecharger that specs out at 525 horsepower, or a Kene Bell polished supercharger, capable of cranking out a whopping 625 horsepower. 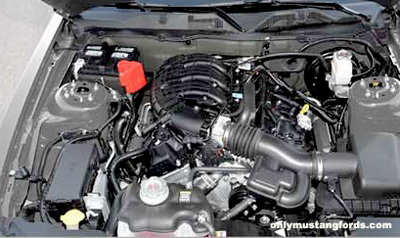 All that potential extra power would be fine on a long runway, but if you want your 2012 Mustang to handle and stop you need more. 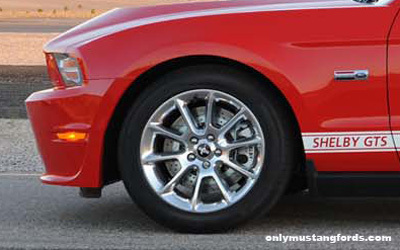 And the optional Shelby/Eibach front and rear suspension upgrades, combined with a wheel and tire upgrade ensure that all that fun meets the road when you need it. The base price for the 2012 Shelby GTS package is $9,995 (plus your own vehicle) and is available directly from Shelby American. Return from 2012 Shelby GTS package to 2012 Mustang specs.